Our Design Bedside tables stand out for their original design that matches and accentuates the elegance of japnese beds of the same series. This is visible for example in the Origami Bedside Table with its delicate and asymmetric lines that resemble those of a folded origami. Diago bedside table is made up of solid lamellar 52-millimeter beechwood; it matches our Diago and straight Diago beds. You can choose a rounded top with a diameter of 45 cm or a squared top with 45 cm long sides. One-coloured or two-coloured finishings. The Ultra bedside table is made up of solid laminated 64 mm thick beechwood. 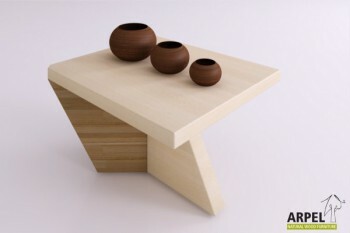 The standard top is 40x40 cm; it's 30 cm high and the laminated beech wooden ledge is 19 mm thick.